My son loves dinosaurs and it was his birthday so made these simple cupcakes for the daycare class. I made a batch of simple chocolate cupcakes. Pipe green icing - in small part of the cupcake to appear like grass or bushes. Place dinosaur lolly against the icing. Crush up chocolate chips and sprinkle on like rocks. So simple and clever. I am sure most kids would be very impressed with this one. Love it! Omg this would be a massive hit in our house! Brilliant! 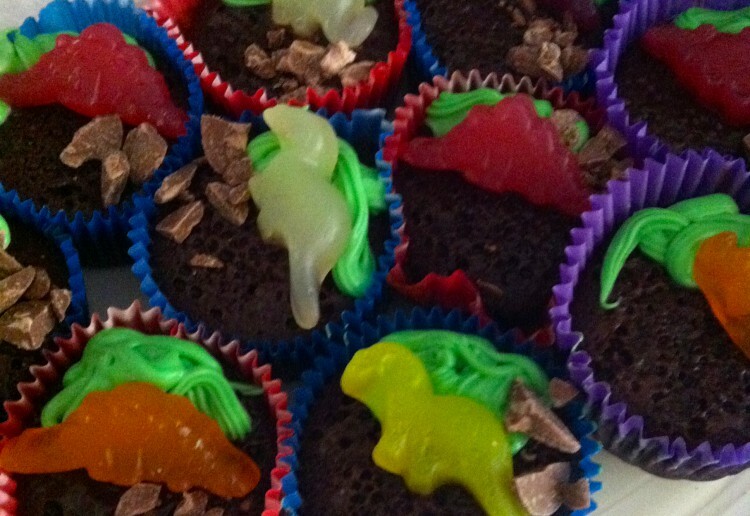 A simple yet much loved addition to any dinosaur themed birthday party. How gorgeous are these dinosaur cups! Perfect for a party! Might add these to the grandsons birthday cake. Great for a birthday party – boys or girls! Children and adults would find these really hard to resist. A wonderfully creative idea; thanks for sharing!. My youngest is a big dinosaur fan and would love these. adorable and cute and kids will just love these……..